What's up Y'all with Redneck Couture – Tagged "4th of july recipes"
"In large microwavable bowl, microwave butter uncovered on High about 30 seconds or until melted." "Stir in seasonings. Gradually stir in cereal and pretzels until coated." "Microwave uncovered on High 4 to 5 minutes, thoroughly stirring every 2 minutes. Spread on paper towels to cool, about 15 minutes." "Stir in mini marshmallows and chocolate candies, and toss to combine." "Divide the prepared Chex Mix™ into three even portions, and spread each portion in an even layer on a foil-lined plate or baking tray." "Heat the almond bark in the microwave or in a double boiler until melted. Divide the almond bark into three equal servings. Color one serving with red gel food coloring. Color the second serving with blue gel food coloring. Then leave the third serving plain (white)." "Drizzle each portion of Chex Mix™ with one color of chocolate. Then let cool for at least 15 minutes, or until the chocolate returns to room temperature." 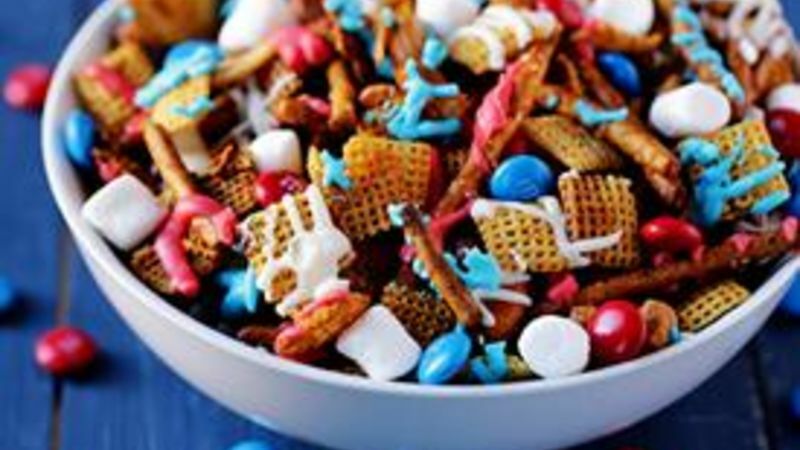 "When it's ready, toss together the three colors of Chex Mix™ until combined, and serve."